What is the LGBT community? Before speaking about the problems of LGBT community, it is necessary to answer the following question: what is the LGBT community? LGBT is a community of people who refer themselves to as lesbians, gays, bisexuals and transgenders. LGBT members face constant issues of being unaccepted by people with traditional sexual orientation. As a result, one of their main priorities is to achieve equality in the modern society. The history of the LGBT community is complex, because society does not perceive bisexuals, gays, lesbians and transgenders as a norm. Despite the fact that according to the Declaration of Independence, “all men are created equal,” the LGBT community still has to struggle for real equality. There are various forms of LGBT discrimination. It varies from unfriendly attitude to such serious problems as the refusal to employ such an individual. As a result, many LGBT representatives are forced to live life, which they cannot control. It is obvious that discrimination is considered a permanent problem for those who belong to the LGBT community. However, the LGBT acceptance process observed during the last few years proves that the LGBT community will achieve real equality in the nearest future. When an individual realizes that his/her sexual preferences are different from those considered normal, he/she has problems with admitting such a fact. Some people start questioning their sexuality, some try to hide it so as not to be rejected by the society. According to the survey conducted among the adult representatives of the LGBT community, almost 40% stated that they were not accepted by their family or even friends due to their gender identity or sexual orientation. Such situations cause serious problems in the LGBT community, which can lead to depression. That is why achieving quality seems mission impossible. According to the above-mentioned survey, only 56% of individuals informed their mothers about their sexual orientation and less than 40% were courageous enough to tell this to their fathers. The fact that people with untraditional orientation had to struggle to inform their parents about their orientation proves that LGBT members have to overcome more obstacles in order to become open about their sexuality in public. Consequently, the equality of the LGBT community remains under the question till present days. The discrimination of LGBT representatives is a serious concern especially when it comes to quality pursuing. For those individuals who consider themselves homosexual or still have to understand and accept their untraditional sexual orientation, social discrimination is their major fear that should be overcome no matter what. Nowadays, open gays or lesbians receive unfriendly stares or even negative remarks regarding their sexual orientation. Many people feel uncomfortable about the LGBT topic, thus they choose not to accept rather than to understand. According to American Civil Liberties Union, discrimination by gender identity or sexual orientation is wrong. Such organizations as ACLU are aimed at raising awareness regarding this problem, they inform about how it can impact individual’s business, employment, housing, social and working environment and many other daily life aspects. The discrimination of LGBT representatives cannot be considered an internal issue. This problem has considerable effects on the whole world. People have to take this issue into the most serious consideration and understand why the LGBT community equality and acceptance is one of the controversial facts about the LGBT community. An online survey was conducted among the LGBT representatives and almost 90% admitted that modern society has become more accepting during the last few years. They are also positive about the fact that the LGBT acceptance will increase in the nearest future. Such results show that LGBT equality is an absolutely possible and achievable task. Despite the fact that we can see some progress in the acceptance of the LGBT community, it is still considered to be slow and controversial. The scholar from the Williams Institute, Gary J. Gates, who helped to conduct the online survey, says that there is a confrontation between individuals who feel this change and notice the acceptance and people who cannot be entirely open because they still feel judged by the society. Such a “change” and “acceptance” are considered to be the result of the LGBT equality process. On the other hand, there will always be people who will never understand such equality and will refuse to admit it. As a result, stigmatization of the LGBT community will never have an end. The more the LGBT community feels accepted, the more individuals will become open about their untraditional sexual orientation. However, people who cannot accept such state of things, for example homophobes, will still protest against LGBT equality. So, it is possible to conclude that the equality for the LGBT community is still in progress, which remains slow and limited. 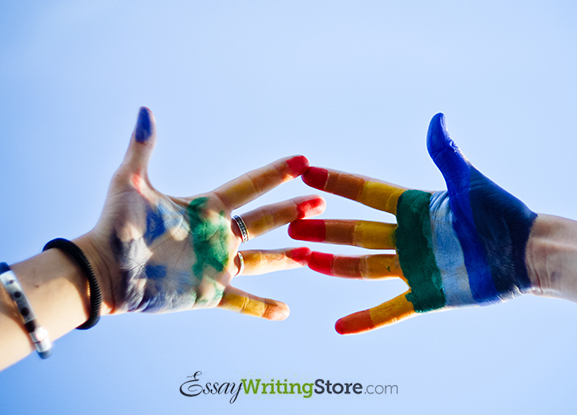 The issue of LGBT equality is often studied at colleges and students have an opportunity to buy LGBT community essay from online writing services. LGBT community faces with discrimination on a daily basis, which proves that equality has not been reached yet. However, there are many positive signs for LGBT representatives. The topic of equality continues to progress. Few centuries ago, it was absolutely acceptable to marry your family member. Nowadays, it is considered a deviation. It means that society tends to change the definition of “normal” with time. That is why things that are perceived as normal today can become unacceptable tomorrow. There is a high chance that LGBT equality, gay marriages or acceptance of untraditional sexual orientation will not even be an issue for the future society. There is no doubt that sexual diversity will stop being a controversial issue in the nearest future. Numerous surveys prove that LGBT acceptance increases and we can foresee that LGBT equality will be achieved soon. Of course, it will not occur immediately. However, the chances are high enough. The community of gays is referred to as the LGBT community. It is a group of gays, lesbians, transgenders and bisexuals, and individuals, subcultures, organizations, as well as different united movements, which support LGBT people. Such communities conduct festivals and celebrations of sexuality, diversity, pride and individuality. Activists and sociologists of LGBT state that their community is a sort of counterbalance to homophobia, heterosexism, biphobia, sexualism, transphobia and any pressures that are present in modern society. The term “gay pride” is often used to show the identity of LGBT people and their strength. The parades of pride are conducted to express the meaning of the term and show the main example of its usage. It is worth noting that the community of LGBT people has different political affiliations. Not every individual with untraditional sexual orientation considers him/herself a member of the LGBT community. Members of the LGBT community can organize movements in support of civil rights for LGBT representatives in different locations around the globe. It is believed that the community of LGBT individuals is underrepresented in the civil rights area. Globalization affected the struggle of the LGBT community to achieve equality in their legal rights. In the USA, the Second World War united a number of men with untraditional sexual orientation and thus their acceptance is higher than in Europe. After the war, those men made a decision to remain united and settle down in big cities instead of going home. Such communities soon became political and started the movement for gay rights. Nowadays, one can find a lot of lesbian and gay communities located in big cities. A number of higher education establishments open support centers for LGBT members. When the Universal Declaration of Human Rights was adopted, the activists of the LGBT community stuck to its major equality concept. Despite the fact that the declaration does not mention the rights of gay people, it still discusses equality for all people and freedom from any sort of discrimination. To sum up, it is possible to say that the LGBT community still has to struggle for its equal rights because not all people are ready to accept the fact that sexual diversity is a norm. It is also necessary to remember that things that are considered traditional in current society may become unacceptable in future. That is why it is possible to state that the LGBT community has all chances to achieve equality in the nearest future and its members will receive an opportunity to live their life to the fullest. Different LGBT organizations do their best to bring awareness to the society about the issue of discrimination due to the sexual orientation. If you want to know more about the LGBT issue, you are free to buy the LGBT essay online. There is plenty of information related to the LGBT topic.